I went to Sisalaland, initially, at the suggestion of Jack Goody, who had studied the LoDagaa to the west, and who proposed a study of the Sisala which would compliment his work and that of my thesis advisor, Meyer Fortes, who had written classics on the Tallensi to the east . I was well pleased with this choice because I determined, through library research, that the Sisala were the most isolated "tribe" in Ghana. I saw that as good because I wanted a "primitive" people I could call my own, like the Tallensi of Fortes, or the Nuer of Evans-Pritchard. I admit this now to set my fieldwork in a both a time in my life and in the life of anthropology. It was a naive time for both, but perhaps we both had to go through it. 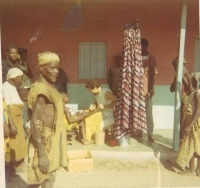 On my way to Tumu, on my first trip in 1971, I was pleased to see women along the Bolgatanga/Tumu road wearing only patches of leaves tied round their waists with a leather thong or hemp cord. I was excited by the prospect of having my very own group of "savages". I was disappointed to find that most Sisala wore cloth, and some even wore cast-off European clothes, which they referred to as "dead white men's clothes," because they could not conceive of the fact that such good clothing would be discarded unless the European had actually died. Putting my immature ideas aside, I contented myself with the fact that even with a few modem props, I still had myself an extremely cut off group of people who would be my intellectual capital, and Sisalaland would be the launching pad of my career. I needed to prove myself to my professors and the profession at large. I was pleased, years later, when I handed a bound copy of my dissertation to Professor Fortes, and he looked me in the eye and said, "Well done, Eugene. Today you've proved your metal." Over the years I have gone back to Sisalaland to do more field studies. I have seen it change. While I naively started out looking for Tallensi-like homogeneity and isolation, what I eventually got was a dispersed group of hamlets which had been greatly affected by the events of colonialism and globalization. Whereas I had hoped for Fortes, I got Eric Wolf. Now, after lots of years and having lived and worked in several different countries, I am torn and thrilled with the changes going on in Sisalaland. They bother me in that I see some as detrimental and having the potential to erase the social ease in which people interact with each other in Sisalaland. On the other hand, my academic interests have changed and the linkages between the Sisala and Ghanaian cities and elites and further linkages to the world economy now fascinate me. I feel privileged to chronicle the Sisala as best I can. Most of all, I am one of the luckiest people to have lived, in that I have had the great privilege of knowing the Sisala who, for the most part, are warm and gracious human beings. That beats naked savages every time. Now my wish is that they can have changes which build on what I found to be so civilized about them, but I fear that not all the forces at work in modem-day Sisalaland are going to improve the lives of all Sisala equally. Already, I see the emerging signs of greater social stratification, for example. What is most maddening is the observable mismanagement and waste I have observed e.g., most Sisala do not have access to the most basic amenities like ample food, water and medical care, yet the government has built a cement Olympic-size soccer stadium in their midst. Broken Tractor, Sisalaland, Northern Ghana The failure of development schemes can be seen in the rubble of broken tractors, rotting buildings, abandoned veterinary kraals and faded signs touting the way forward in this or that NGO or government project. I have always been somewhat distrustful of change, and what I have seen in Sisalaland has not lessened that unease. What worries me is that the Sisala people will loose the graciousness of character they possess and their relative egalitarian lifestyle. I have seen societies loose the ties that bind them into a human community. I have seen people turned into commodity-seeking pawns of capitalist over-production, being sucked into a life of shopping and over-consumption. I have seen my own society transformed into a world of widespread divorce, child abuse, graffiti-sprayed buildings, crime-ridden streets, and lonely people living in boxes, watching boxes each family member in different room watching a separate television. I have seen my society become one in which human beings relate better to their machines than they do to each other. I don't want that for the Sisala. It doesn't matter how full your closet is, if your heart is empty. PERSONAL CHANGE & THE EMERGENCE OF SALIA BUJAN I had great respect for Meyer Fortes, who was always very kind to me and always seemed a warm human being who frequently invited anthropology students into his home and who would patiently listen to our efforts to find our anthropological personalities. Yet Professor Fortes and I were from different cultural backgrounds and eras. Perhaps we had different temperaments as well. In any case, he gave me some advice as I headed off to Africa for the first time. His exact words were, "Eugene, keep your distance from the people. Remember who you are." I have thought about those words many times throughout the years, largely because I did not heed the advice; in fact, I did the very opposite. Viewed in their worst light, these words could indicate that the people are subjects to be studied like bugs or fossil bones. Indeed that image can be evoked by the book cover photo of the young field worker Meyer Fortes sitting on a chair in his pith helmet with the Tallensi sitting on the ground around him, while he assiduously made notes on the paper in his clipboard. On the other side, I often worried that Meyer saw some terrible flaw in my personality which he, in his kind paternalistic fashion, feared may lead me to "go native." In any case, when I arrived in Sisalaland I was seen by the people as a long-haired white boy, one of the many who began to wander around West Africa in the sixties. I was called foli, which means "white man." I felt that this label distanced me from the people, and I didn't like that. so I refused to respond to it and demanded that people call me by my Sisala name [which at that time I didn't have]. "What is your Sisala name?" people would ask. "I don't know", I would respond. Word got around that this white boy was pretty strange, but I persisted. About three months into my first field trip an event occurred that helped bind me to the people. I wish I could say that I planned it, but it just happened. I had arranged for several churches and NGOs to provide me with medical supplies. Since I had been in the medical corps in the US army, I had enough medical training to hold a daily clinic where I patched up cuts and bruises, dispensed aspirins and vitamins and rubbed in the greatly-admired Absorbine Jr. which had the sought-after immediate effect of appearing to work on over-worked muscles. While the clinic was a big hit and did give me a role to play in the village that the people could understand and identify with, that is not the event I am talking about. What happened was this: I had no place to put the boxes, bottles and vials of medicines arriving in the mail, but I noticed that there was a bookshelf left over from the abandoned school in the village. 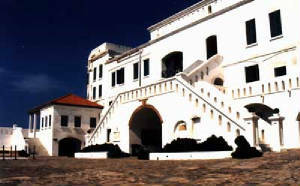 It was encrusted with goat and chicken feces and served as a sleeping quarters for the former and a nest for the latter. I wanted that bookshelf for my clinic so I approached the village chief, Bawule, with this request. I sent my helper, Bubachebe, to request an audience with the chief. He returned to tell me that the chief would see me and I walked from my house in the lineage of Fuojang to his two-storied "palace" in Bakujang. 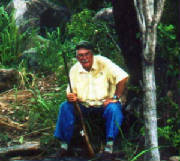 He was sitting on a cow-skin under a shade-structure made of logs and dry grass. I greeted him, sat before him and "begged" him for the bookshelf, using the well-known Ghanaian hand gesture of respect [one places the back of the right hand into the palm of the left hand and taps it several times to implore acquiescent to one?s request]. The chief told me later that this event changed his perspective toward me and that he discussed this with the village elders who all agreed that this showed that I was a good person. While it just seemed the normal thing for me to do, this gesture of respect didn't fit with their image of the white man. Prior to my arrival they had had little contact with whites, but held an image of whites as conquerors and administrators who didn't request - they demanded. Unwittingly I had helped my integration into their world. Later the chief, with whom I became very close, laughed and told me that after that event he began to see me as a human being, not a white man. He told me that when I first came to the village to ask if I could live there and write a book about the Sisala people, he suspected that I was a government spy, even though by that time  the government was no longer dominated by white colonials. Then, as I began to ask so many questions about the past, inquiring as to whether the people still adhered to the customs and mores of their ancestors, he came to think that I was an ancestor who had come in the form of a white man to check up on them. The simple event I have just described changed all of that. From then on Bawule and the elders saw me as just another human being doing his work, however strange the work of ethnography seemed to them. But the problem of what to call me persisted. I was studying divination and hung out with diviners a lot, sitting though countless divining sessions. 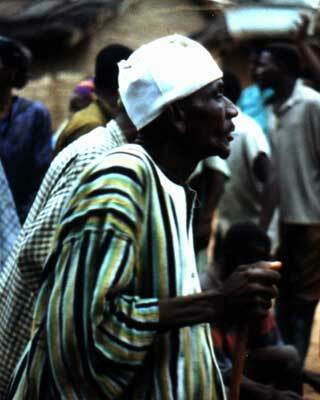 One day the head diviner showed up at my compound with an entourage of village elders. The said that since I was becoming a diviner, I needed to have a Sisala name. They had consulted a diviner and determined that my name was Salia Bujan. Salia is Sisala name adopted from Islam and locally means "good citizen". Bujan is the name of the village where I conducted most of my research, hence Salia Bujan. Let me give you an idea the ramifications of this name. It has helped the people identify with me and my work on countless occasions. Songs have been created about me and they are still sung today, thirty years later. In 1998, nearly thirty years after I was dubbed Salia Bujan, I took a group of undergraduate students to Sisalaland. We had a van which enabled up to travel to various distant villages which I had never visited during my previous three field trips. On one of our excursions to the village of Gwolu to photograph the remains of the great wall built around the turn of the century to ward off slavers the reputation of Salia Bujan preceded us. Upon arrival, with their undergraduate enthusiasm, the students bailed out of the van and began snapping photographs of the wall. Seated nearby under a large Mango tree was the village chief and several elders. The chief sent one man to stop us from photographing the wall, claiming that we had done so without first greeting the chief and seeking his permission. I gathered up the students and we approached the chief. The interpreter informed us that the chief was angry and demanded a payment before we could proceed with our picture-taking. 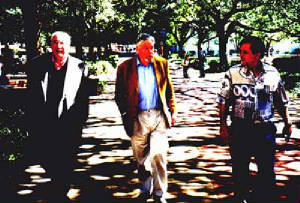 My research assistant asked the chief if he knew who the older leader of the group was, the white man with white hair. The chief replied that he did not. My assistant then informed him that it was Salia Bujan. I had never been to Gwolu, which lies a hour and half by car from where I conducted my research. I had never met the chief or anyone from Gwolu. Yet they had heard of Salia Bujan, the name in the songs sung at celebrations throughout the land. The whole demeanor of the encounter changed instantly. The elders gasped, then laughed. I was made the guest of honor and warmly welcomed to their village, and of course, was given permission to take all the photos I wanted - free of charge. In spite of this offer, I sent a runner to buy several bottles of native gin for the chief and elders, which further cemented by newly-established relationship with them. HUMANISM FOUND I was born Eugene Louis Mendonsa, but in some ways I am now more at ease with the name Salia Bujan. Most of the students who get close to me call me Salia, at my request. Really close friends know me as Salia. In some deeply meaningful way, in my mind, the warmth and humanity of the Sisala people has become infused into the name Salia Bujan. I went against my professor's advice. Sacrifice of an ancestor shrine I did not keep my distance, but rather took a Sisala name, became a diviner, sacrificed upon shrines I kept in my compound, wore a soul bracelet like the Sisala, participated in the rituals and festive events of the community. Meyer Fortes kept his distance and produced ethnographies which became classics in anthropology. I have become much more enmeshed in the lives of the Sisala people and have produced ethnographic works which have had much less impact on the field, but I have gained something else - a deep sense of belonging in Sisalaland, and an awareness of our common humanity. Across barriers of skin color and radically-different cultural backgrounds a link has been established. I have bought land in Sisalaland. I am building a house there. I plan to retire there. In some meaningful way, the Sisala have created another avenue for me to express myself, one which is deeply human and community-centered. For that I am profoundly grateful. 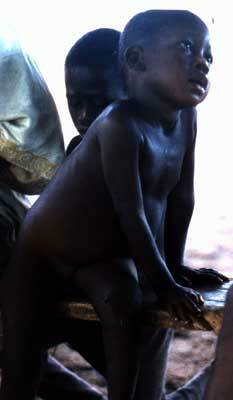 They have also given me opportunity to use my anthropological knowledge to help the Sisala people. I have formed a non-profit organization called STS, Sustain the Sisala, that is designed to provide the people with sustainable farm equipment, namely bullocks and plows. As Salia Bujan, I have had many discussions with farmers and village elders about how to improve life in the village. We have generally agreed that a water source to provide dry season irrigation water would greatly improve farm output. The creation of a reservoir near the village is a long-term goal of myself and Nenkentie Badzongoly, my long-time research assistant and friend. Nenkentie Badzongoly started his life as farmer's son, receiving a traditional upbringing at the side of his father, learning Sisala customs and traditional methods of farming. Because his elders discerned that he was an especially bright boy, he was taken from the farm to become one of the chosen few to attend the village school established by Kwame Nkrumah, the first leader of Ghana. Having done well in primary school, he was then sent to live in the homestead of the chief of Tumu, where he received his secondary schooling. Equipped with a knowledge of English learned at school, and having good insight into the customs of the Sisala, he became a valuable and trusted aid to me. Nenkentie helped the anthropologist with the Sisala language, translating for me when I could not understand what was going on, and generally he accompanied me as I went about the tedious task of documenting the Sisala way of life. My link with Nenkentie was broadened as his lineage incorporated me into the family. Eventually I came to call Nenkentie by the term mi nanuala, my son and he called me mi nyimma, my father. While everyone involves realizes that this is a fictional linkage, it shows the extreme importance of kinship in the lives of the Sisala. Once I had a name and a kinship status, I was automatically linked to other people and kinship groups by fictive kin ties, having normal rights and duties in the community. Nenkentie and my other assistant Bubachebe were bright spots for me. I was devastated when I returned to Sisalaland in the mid-1970s to find both of them suffering from river blindness, or onchoceriasis. Unfortunately Bubachebe died in his mid-twenties, before I was able to get him cured; but I was able to get Nenkentie the correct treatment, and he recovered. 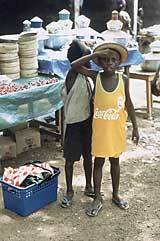 Also, I arranged for funding to send him to college in Kumasi, a large city to the south of Sisalaland. Ghanaian college students, 1970s I had considered bringing him to the USA to attend college, but felt that this could Westernize him too much, and that he could get cut off from his family and roots in Bujan. Throughout the next few years, Nenkentie studied hard, and I taught college in the states, and started a cross-cultural consulting business that I ran during the 1980s and 1990s. While I traveled around the world, my thoughts always returned to Sisalaland and the gentle people amongst whom I had lived. I wanted to help them in some way. I had always kept up on the literature on appropriate technology and organic gardening, and began to feel that I could do something to help improve the lives of the villagers in Sisalaland using this knowledge. I found myself searching the internet for windmills, composting methods and the like, hoping to find the right combination of sustainable technology to use in my development of village economics. During this time, Nenkentie graduated from college in accountancy, and began his career as an accounts clerk, eventually working his way to the position of senior accountant with an international firm in Kumasi, Paramount Distillers, Ltd. While he kept up his ties to his family in the village, he became a migrant's success story, marrying two wives and fathering five children. Ghanian father & childrenFluent in Twi, the language of the native residents of Kumasi, Nenkentie became a respected member of his urban community, easily moving among Sisala migrant circles, and in those of southerners as well. Through the years Nenkentie and I corresponded, sometimes loosing track of each other, but always picking up the relationship again. 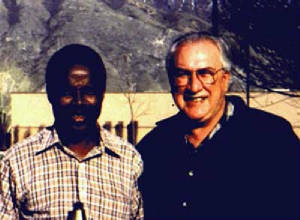 Anthropologist's Ghanaian helper Having partially left the world of business and returned to academia, in early 19981 phoned Nenkentie and asked him to take a leave of absence to accompany me to Sisalaland to see firsthand the changes about which he had written me. Nenkentie came to America to help me with the editing of the film, Sisala Divination: The Mystic Tradition. I was able to show him many places, New York, Salt Lake City, Utah's great southern parks, San Francisco, the coast of northern California, the Redwoods, and he was able to meet my aged parents and brothers and sisters who live in northern California. It was a great trip for him and he is now considered a "been to" in Ghana, a Ghanaian who has traveled abroad. We still stay in touch by email and his son, Eugene Louis Badzongoly, also writes me (he calls me grandpa) from time to time. 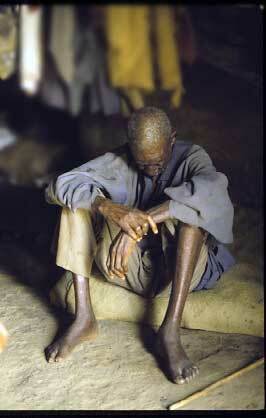 Knowing Ghanaians, the Sisala villagers and especially Nenkentie has enriched my life immensely. 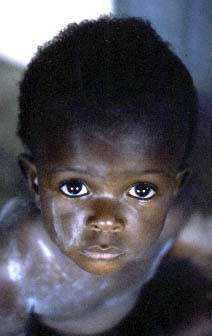 Going to Africa was a life-altering experience, one that made me a better person. Thank you Africa. I have lived, on and off, in Africa for 9 years. I love the continent and the people and, of course, I have written some books and articles on the history and culture of Africa. Here are some photos for your viewing pleasure. 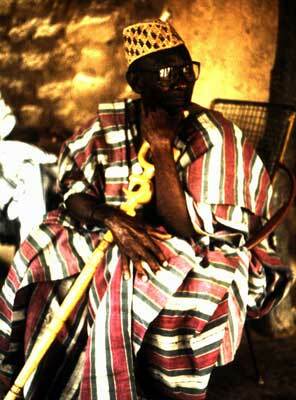 I lived with and studied the Sisala culture in the Upper West Region of Northern Ghana, which is the source of most of these photos. I am putting sticky dots on the village kids who loved to wear them (1998). Yalingbong was a 19th century hill fortress used by some Sisala villagers as a defensive site against the Zabarima slave raiders who were ravaging the countryside. I discovered its ruins and it has since been excavated by my student, Natalie Swanepoel. A child of my adopted son, Nenkentie Badzongoli. 3 Africanists who worked in Ghana: Drs. Mendonsa, Goody & Grindal. Little guy in my village of Bujan. He never wore clothes & never smiled, which is uncommon there. 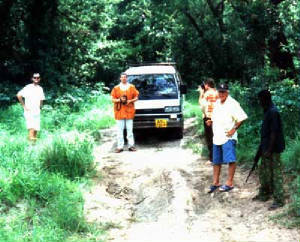 Here I am with my van & students from the university in the African bush. 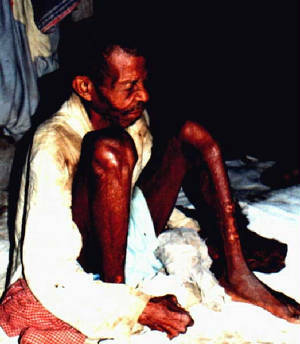 A blind elder in the village of Bujan. 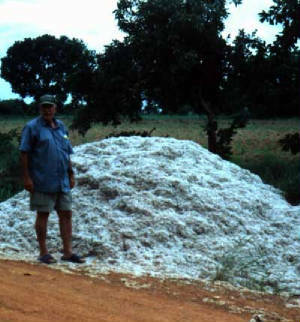 Ethnographer with discarded, spoiled cotton, Northern Ghana. 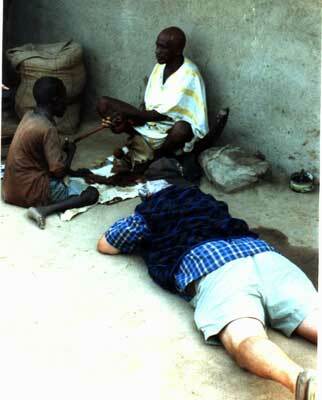 Here I am filming a client consulting a diviner for my film on divination in Africa. 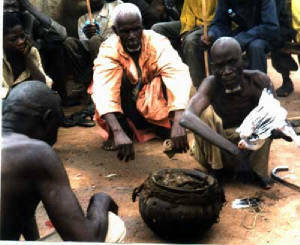 Vilalge elders sacrificing on the village Vene shrine. 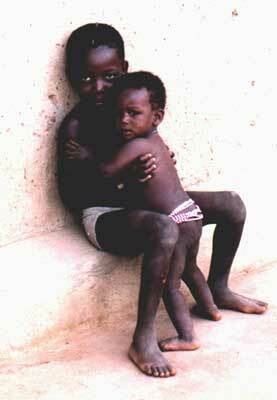 Two village kids, Northern Ghana. 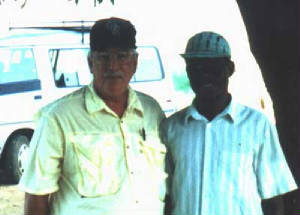 Salia (Dr. Mendonsa) & Nenkentie Badzongoli, Northern Ghana, 1998.